Car accidents are the most common source of personal injury claims and lawsuit in Pennsylvania. If you or your passengers are injured in a car accident in Pennsylvania you may be legally entitled to recover monetary damages from the at-fault driver. This page offers a brief overview of Pennsylvania law regarding car accidents and personal injury claims. 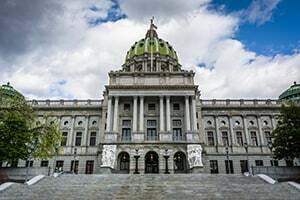 Like all states, Pennsylvania enacted statutory laws which put maximum time limits on how long a potential plaintiff can wait before filing a lawsuit. If the lawsuit is not filed before this time limit expires the plaintiff will be legally barred from filing the claim. These time limit laws are generally referred to as a statute of limitation. These limitation deadlines vary depending on the type of claim or injury involved. Under Pennsylvania law car accident claims are subject to the general 2-year statute of limitations for personal injury claims which is set forth at 42 Pa. Con. Stat. Ann. § 5524. In certain types of personal injury or malpractice cases there is some question as to exactly when the 2 year limitation period begins to run. In auto accident cases, however, this question is very simple: the 2 year time limit for filing a lawsuit begins running on the date of the car accident. So if you get injured in an auto accident on May 1, 2018 you must file your lawsuit in connection with that accident on or before May 1, 2020. Complying with this 2 year limitation is extremely important because if you fail to file your case before the time limit ends your right to file a claim for the accident will be lost forever. These limitations periods are applied very strictly. If you miss the deadline it won't matter whether it was your fault or what the explanation is. The courts in Pennsylvania will simply dismiss your case. EXAMPLE: Plaintiff Pam is stopped at a red light when she gets hit from behind by Defendant Debbie. The case goes to trial and the jury finds that Plaintiff Pam was 10% at fault for the accident because one of her brakes lights wasn't working properly at the time. The jury awards Plaintiff Pam $100,000 in damages but they get reduced to $90,000 based on her 10% share of fault. Pennsylvania has adopted a very unique choice "no-fault" system for car accidents and insurance claims. 75 Pa. Con. Stat. Ann. § 1705. Under this system Pa. drivers get to choose between 2 types of car insurance coverage: full tort OR limited tort (no-fault). Under the no-fault option it doesn't really matter which driver was at fault in a minor car accident because each driver's damages from the accident get covered by their own auto insurance company regardless of responsibility. EXAMPLE: Plaintiff Pam is stopped at a red light and gets rear-ended by Defendant Debbie. Pam's brake lights are working this time so Debbie is 100% at fault for the accident. Both Pam and Debbie's vehicles are seriously damaged but neither of them have any major injuries. Pam's injury damages will get covered by her own auto insurance company (State Farm). Debbie's damages will be covered by her insurance carrier (Allstate). Under the no-fault system, claimants are limited in the type of damages that will be covered by their insurance. No-fault coverage will only pay for economic damages (i.e., lost wages and medical expenses). No-fault coverage will not pay for non-economic damages such as pain & suffering. There are very limited exceptions to the no-fault limits which allow liability claims against at-fault drivers for accidents involving "serious injury." To qualify as a "serious injury" and avoid the limitations of the no-fault system the injury must involve permanent impairment or disfigurement. At a minimum it needs to be more than a so called "soft tissue" injury such as whiplash. For Pennsylvania drivers who select the full tort insurance coverage option, they are free to pursue liability claims against at-fault drivers for all economic and non-economic damages allowed by law. Car accident claims in Pennsylvania can be somewhat complex because of the unique choice no-fault rules. The auto accident lawyers at Miller & Zois can help you understand these rules and help maximize your potential recovery. You can call Miller & Zois at 800-553-8082. Free claim evaluations are also available online to answer any questions you may have.